I have been in a funk lately. I am very much a home body and my kids are not because well they are kids. If it was just me home all day I would be happy getting things done around the house and being lazy the rest of the time. But it isn’t just me anymore, I now have two young kids who are always moving and I need to find ways to keep up with them. One of the ways I have been able to keep up with them recently is with our activity sticks. My Pinterest board is just packed full of activity ideas that when I try to go on to pick just one I get so overwhelmed and end up choosing none. With my activity sticks I pick out my favorite activities, compile them into a list and have my kids choose 2-3 to do each week, which also helps with my indecisiveness and gets my kids joined in with the planning. For activity sticks the first thing that you need to do is pick categories. I decided to go with 5 categories of activities: art projects, science experiments, motor development, special treats and field trips. Then within those 5 categories I chose 12 activities for each. If you are lucky enough to live somewhere warm, oh how I miss being able to go to the park everyday, you can add categories like outside play. You could even create categories that revolve around teaching specific concepts like colors, counting, the ABC’s, and so on. There are so many possibilities for your categories and so many ways to get creative to make it fun. Next you need to make your activity sticks. Find some paint in your paint stash, if your a crafter you likely have a drawer or box somewhere full of half empty paint tubes. Or if you are out or don’t like your colors than head to the store and pick the same number of different colored paints as you have categories. Then buy enough popsicle sticks for the number of activities you have. 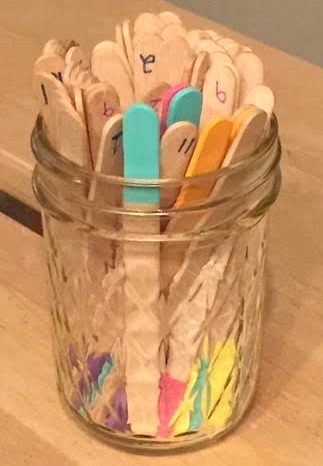 With my 5 categories and 12 activities in each I used 60 popsicle sticks (these are super easy to find at a craft store or even in the craft section at Walmart). 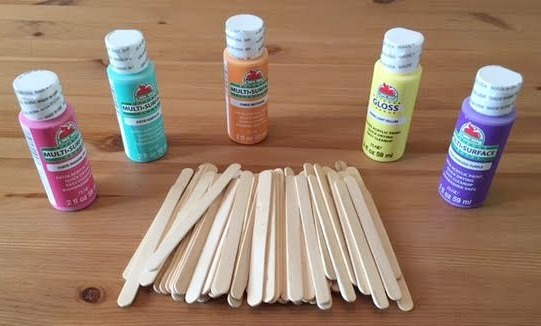 Gather all your supplies and paint one end of each group of sticks a color and continue with each group of sticks with a new color until you are done. Then what I did next helped my indecisiveness even more, I wrote a number, 1-12, on the bottom of each stick and then numbered my activities in a word document. This way when my daughter chose an activity stick I didn’t have to go through that category and pick which one we were going to do, it was already assigned. Your activity sticks are ready! For easy storage I ended up putting my activity sticks in a small mason jar. I then ended up putting the sticks in with the colors on the bottom because of the first time my daughter chose a couple activities. That first time I had the colors facing up and she ended up choosing based off of which colors she liked the best, I had to convince her to choose only one pink one. So I decided to put the colors on the bottom of the jar (this way her choice would be totally unbiased) until it was chosen and then the color is on top so we know which ones we have already done. Now here is the list of all of the categories and activities we chose. We have done a few so far, I have my daughter choose 2-3 of the activity sticks on Sunday night so we have time to go to the store if we need to on Monday morning and then we do the activities throughout the rest of the week. As I post our activities in their own blog posts I will link them down below so you can have easy access to their tutorials. 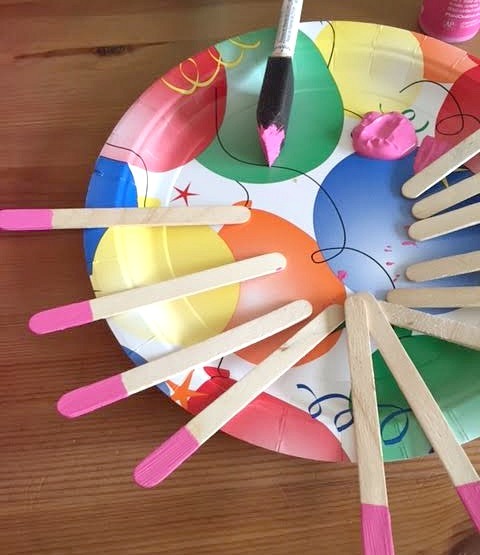 Now get planning, search your Pinterest for some fun activities and paint your activity sticks. Let me know which fun activities you and your kids did and which ones you are the most excited about doing.